Science Fiction Geeks - Scifi News: Who are the Masters of Science Fiction from this past decade? Star Trek the original series Wetsuits? Millenium Falcon Bed = AWESOME! Syfy renews Sanctuary and Stargate Universe! Who are the Masters of Science Fiction from this past decade? Stephanie Fox has created a chart showing who were (in her opinion) the "True Masters" of scifi for io9. Some of the guys at the top were: Peter Jackson (around 2002), Andrew Stanton (2005), and James Cameron (2009). 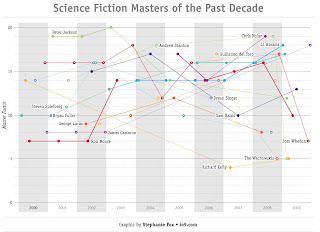 It's definitely an interesting chart to see who had a lot of influence in the scifi world over the past decade, and I enjoy seeing how the transition has got us to the present state. Star Wars is not SciFi it is Fantasy, Lucas should not even be on that list. Cameron and Spielberg are the Kings.